Designed for Serato� software users, specifically for �Serato DJ,� the DDJ-SP1 is a slim and compact sub-controller that uses multiple performance pads, controls, buttons, and knobs to trigger a variety of unique audio samples and effects. 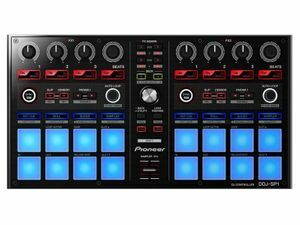 The DDJ-SP1 is designed to be the ideal companion to Pioneer�s new DJM-900SRT mixer but can also be matched with other systems via its MIDI controller functionality. The DDJ-SP1 is made for Serato software users who want to add effects when using a professional DJ setup of two players and a mixer such as the DJM-900SRT. With the sub-controller, DJs can enhance their performances with multiple effects, similar to what's being done with our extremely popular DDJ-SX controller for Serato DJ. The DDJ-SP1 includes a free of charge download of a Serato Video plug-in (valued at more than $100). The plug-in is compatible with Serato DJ, Scratch Live and ITCH, that makes it extremely easy for users to insert video, effects and image files with music.